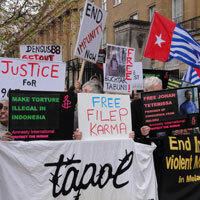 Together with civil society partners and associates, TAPOL undertakes national and international advocacy and campaigns to raise awareness of human rights, peace and democracy concerns in Indonesia, including the contested territory of West Papua. TAPOL provides a bridge between Indonesian civil society, western public opinion and policymakers to facilitate the exchange of information and create platforms for the Indonesian voice to be heard. In this way we enable Indonesian civil society partners to be kept informed about and better understand international developments and mechanisms that affect them. Our unique news translation service supports this role, providing dozens of translations every month. We work closely with local organisations in Indonesia and maintain a small-grants programme of core grants and project grants to assist and strengthen partner organisations engaged in the promotion and protection of human rights. We pay particular attention to the needs of Human Rights Defenders, whose brave work makes them particularly vulnerable to violence and intimidation.